Canada came away with four medals Sunday at the third World Rowing Cup event of the season in Lucerne, Switzerland. Hillary Janssens and Caileigh Filmer began the string of podium finishes for the women's team by taking silver in the pair race. The duo finished with a time of seven minutes 7.630 seconds. New Zealand crossed the line in 7:07.200 for the win, while the U.S. rounded out the podium at 7:17.790 on the 2,000-metre course. 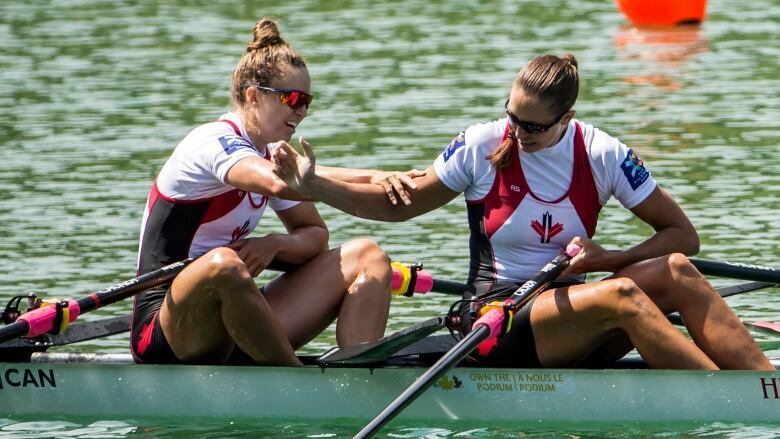 "It just felt really close the whole way with the New Zealand boat," Janssens told Rowing Canada. "It was great to race them and we can see why they're the world best time holders and reigning world champions. It'll be fun to continue racing them and see where the season takes us." Canada was just getting started as Carling Zeeman raced to a bronze medal in single sculls in 7:37.030. Switzerland's Jeanine Gmelin reached the top of the podium at 7:35.940. Sanita Puspure of Ireland clocked 7:36.170 for second place. "I wasn't at this caliber at Belgrade [Cup 1] as I was just coming out of an injury and lacked some confidence," said Zeeman. "At this regatta, I've just been remembering my training and as the other Canadian crews have done so well, it really gave me lots of confidence to do well myself. I just kept thinking about internal queues and really working on technique. This was a really fun race and it's rare that we get to race at such a calibre." In double sculls, Andrea Proske and Gabrielle Smith covered the 2,000m distance in a time of 6:52.800 to capture silver. New Zealand won gold with a time of 6:50.120 and the U.S. nabbed bronze at 6:53.040. "This is our first international race and we've only been rowing together for three weeks and to compete in such a field of competitors has left us speechless," said Smith. The women's eight squad was responsible for Canada's third silver medal as they timed in at 6:08.110, behind New Zealand at 6:06.170. The U.S. was third at 6:09.170. "It was a really good race," said Sydney Payne. "We really learned from our heat and were able to incorporate changes into today's races. "Following this event, some of us will be going to Under 23 Championships and from there we will await selections for the World [Senior] Rowing Championships in September."